Scientists around the world are working on green energy technologies like solar cells. But researchers in Christine Luscombe’s lab at the UW Clean Energy Institute have set themselves an even stricter task: they want to make solar energy in a greener way, using more environmentally friendly ingredients. “We’re trying to get the whole package of sustainability, in terms of energy but also in terms of the materials that we use in the first place,” says Luscombe, an associate professor of materials science and engineering at UW. Luscombe’s work focuses on organic photovoltaics (OPVs), meaning solar energy devices in which polymers – long, chain-like molecules made of repeated subunits with a carbon backbone – capture sunlight and convert it to electrical energy. OPVs are one of three main approaches to solar energy. The problem is that making the ink itself is tricky. When researchers produce a batch of light-absorbing polymers, they often end up with a mix of molecules of many different lengths. These molecules of various sizes also have different abilities to absorb and transform light. So without being able to reliably mass-produce identical polymers, researchers can’t mass-produce solar devices that work in a consistent way. 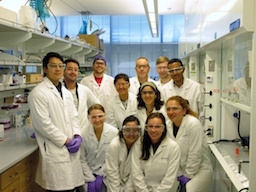 Luscombe’s group is tackling this problem with a method known as controlled polymerization to make a class of polymers called polythiophenes. This method, sometimes called living polymerization, adds links in the polymer chain one by one to build molecules of precisely specified length. It’s a cutting-edge technology with many applications, but applying it to solar energy materials involves additional challenges because these materials also have to conduct electricity. More uniform polymers make for more efficient solar devices, Luscombe and her team have found – a major advantage, since OPV solar cells are currently only about half as efficient as silicon ones. “The same polymers are commercially available, but the ones that we make in our lab using our chemistry do perform better,” Luscombe says. Initially, many researchers in the field did not appreciate the importance of having uniform molecules in OPVs. Nor did they pay much attention to how the atoms at the ends of polymer chains influence the function of the molecules, another focus of the Luscombe group’s research. That’s beginning to change. “It’s being confirmed not just by us but by other people, and that’s been rewarding,” she says. Another difficulty is that the polymers for OPVs require many steps to make. This is because the links that make up the polymer chain are not particularly reactive, meaning that they are not very inclined to join together. So researchers have to attach the links to more reactive chemicals first, and then use this reactivity to bring the two links together. Not only is this process arduous and circuitous, but it requires the use of toxic heavy metals such as tin as reagents. “We don’t use a huge quantity,” Luscombe says. “But although the tin doesn’t end up in the final material, we’re producing it as a waste product along the way.” So the team has been working on ways to join two links in the polymer chain together directly, to eliminate the need for toxic catalysts and simplify the overall process. “Ultimately where we’re trying to go with this is to combine the two approaches,” says Luscombe. “Right now they’re pretty separate. You can’t do a controlled polymerization with this greener chemistry.” Essentially, the researchers’ next task is to polymerize their insights, and bring two scientific advances together into a single process. To do that, the team is working to design a new molecule, a catalyst with two functions that will join polymer chain links directly and in a controlled way. “We’re trying to combine those two catalysts into a single catalyst,” she says. But in the meantime, the researchers have begun dreaming up lots of potential applications for their solar materials. OPVs are lighter than silicon solar cells, and they can be flexible. Perhaps they could be made into curtains or window blinds, woven into clothing, or sewn into backpacks and tents to power remote scientific fieldwork. The Clean Energy Institute itself acts as a kind of catalyst for some of this work. “Having the CEI and its network of scientists has enabled us to get little pockets of money to test out new ideas,” Luscombe says. For example, the team recently received some seed money from the Institute to investigate how to make their OPV material stretchable.